If food is the best part of your Super Bowl celebration, this 52-ingredient super sandwich aims to feed and please every one of your game day guests. To celebrate Super Bowl LII happening in Hormel Foods‘ home state of Minnesota, the company partnered with master chef Ron DeSantis to create the unforgettable meal for football fans and foodies everywhere. His gigantic sandwich, with an ingredient for every year of the Super Bowl, stands 9 inches tall, 24 inches long and 16 inches wide. 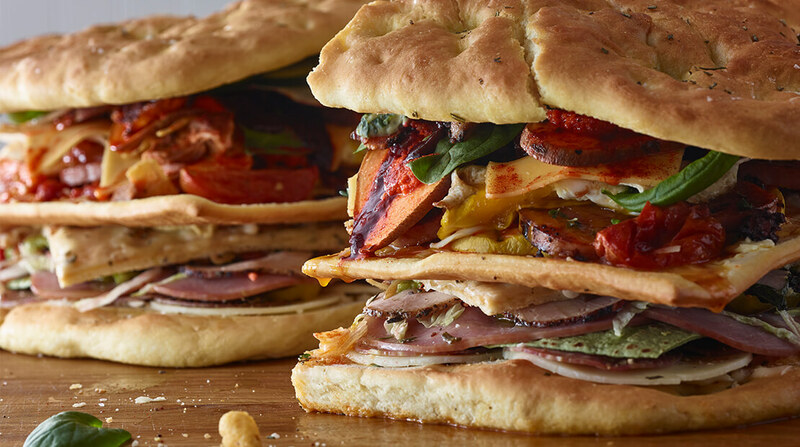 The bottom half is made up of cold ingredients like salami, banana peppers and avocado spread, while the top half is filled with hot fixins like spinach artichoke dip, oven roasted turkey breast and grilled zucchini. Unique additions include sambal oelek and cranberry mostarda, but, as chef DeSantis points out, you can swap any of the ingredients for your favorites.